Boost your confidence and focus for golf, tennis, baseball, softball, motocross, auto racing, volleyball, triathlon, and equestrian sports with our exclusive Audio programs from Peak Performance Sports. If you don’t see your sport, check out our popular The Confident Athlete Audio and Workbook Series. Whatever your sports preference, we can help you improve mental toughness for your best performance every time! Visit our Sports Psychology Proshop to browse all mental toughness programs. The Golfer’s Mental Edge Audio/CD and Workbook program is ideal for any amateur, collegiate, junior, or tour professional golfer, as well as golf coaches or instructors. Learn the secrets to better focus, confidence, and composure. Dr. Cohn teaches you the top eight golf psychology lessons he teaches his students to give you the mental edge. -Digital Download Only: $299 - BUY NOW! -CDs Shipped to You: $399 - BUY NOW! If you can putt or chip well on the practice green, but not on the course, this is a mental game issue. “Breaking The Yips Cycle” is a complete brain dump of the TOP NINE mental training sessions Dr. Cohn teaches his personal coaching students to help them overcome the yips and play with freedom again. -CDs Shipped to You: $349 - BUY NOW! The Mental Edge For Baseball and Softball Players program teaches you how to improve your mental game in 8 easy-to-apply-lessons- the same TOP lessons that Dr. Cohn teaches to baseball and softball players everyday in his one-on-one mental coaching program. Seven bonus programs included! -Digital Download Only: $87 - BUY NOW! If you can't make short throws, this is a mental game issue and not a physical challenge. “Breaking The Yips Cycle” is a complete brain dump of the TOP Eight mental training sessions Dr. Cohn does with his personal coaching students to help them overcome the yips and play with freedom again. -Digital Download Only: $249 - BUY NOW! -CDs Shipped to You: $299 - BUY NOW! Learn how to teach your team to have unshakable self-confidence (practice and drilling are not the only methods to develop confidence). It’s not hard or impossible to achieve. Your athletes can learn the same strategies Dr. Cohn teaches to ball players who lack confidence or have his doubt. -CDs Shipped to You: $79 - BUY NOW! 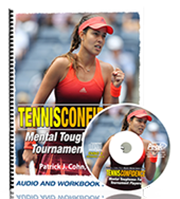 The Tennis Confidence Audio and workbook program is an ideal program for any competitive tennis player. You will learn how to overcome a lack of focus, low self-confidence, and other mental game obstacles you experience when you play in matches. Learn practical mental game strategies to overcome most mental game barriers. -Digital Download Only: $399 - BUY NOW! Designed to teach soccer players how to perform with confidence, composure, and focus in training and competition. 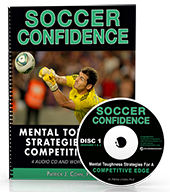 “Soccer Confidence” is also great for coaches and parents who want to learn how help their players be mentally tough on and off the field. Workbook and 4 CD’s to help players improve mental toughness for soccer. -Digital Download Only: $179 - BUY NOW! -CDs Shipped to You: $199 - BUY NOW! If you are ready to improve your mental toughness and perform with ultimate self-confidence in competition, we have a program that will do just that. Your gymnastics mental game experts share with you powerful mental strategies to help you (or your team) perform your best in training and competition. -CDs Shipped to You: $297 - BUY NOW! This Audio/CD and Workbook program is ideal for any competitive figure skater. It's a complete brain dump of the TOP eight mental training sessions Dr. Cohn teaches figure skaters to help them improve their mental game and consistency – from how to mentally prepare for competition to performing under pressure. -CDs Shipped to You: $197 - BUY NOW! “The Mental Edge For Volleyball: This is Audio and Workbook program is ideal for any club, academy, college, or professional volleyball players. In addition, volleyball coaches, instructors, and parents would also be wise to teach the strategies we provide in “The Mental Edge For Volleyball” to their players. -Digital Download Only: $197 - BUY NOW! “Triathlete Confidence” is a workbook program of the TOP eight mental training sessions we teach our triathletes to help them boost racers’ mental game and improve consistency – from how to mentally prepare for races to performing under pressure with mental toughness. -Digital Download Only: $97 - BUY NOW! Equestrians learn how to prepare mentally before competition, cope better with pre-show jitters, manage stress-producing pre-show expectations, stop over-coaching yourself, trust in your abilities and your horse, and focus only on what’s important to your performance. You’ll get a 70-minute CD program with four bonuses. -Digital Download Only: $59 - BUY NOW! -CDs Shipped to You: $69 - BUY NOW! MX racers learn the top four mental breakdowns that can cause arm pump, why some theories about arm pump are dead wrong, how to fuel your self-confidence before each moto so you can make it to the podium, and how to race with freedom and composure. Learn six mental strategies to help you race your best. -CDs Shipped to You: 69.00 - $79 - BUY NOW! Overcome most common mental game roadblocks to a racer’s success. Learn how to implement the six most powerful mental game strategies to supercharge your confidence and help you get into a “zone” focus. Cultivate a winning mindset by implementing the prescribed steps for pre-race mental preparation. -Digital Download Only: $54 - BUY NOW! -CDs Shipped to You: $59 - BUY NOW! Please order with confidence using our secure shopping cart at Peak Performance Sports – your personal information is always 100% safe with us. We’ll guard it with our lives! Call toll-free 1-888-742-7225 to order by phone.